Welcome to the UK – home of afternoon tea, overt politeness and the longest serving monarch in the world. But there’s a lot more to the United Kingdom than Buckingham Palace and ‘pleases’ and ‘thank yous’. There’s no end of diverse places and experiences waiting for you between these shores. It may be small, but this just means that you could be hiking in the Scottish Highlands one day and partying in the bright lights of London the next. You might think that the UK isn’t the most budget-friendly destination, and well, you’d be somewhat correct. But, stay in any of these fantastic hostels to massively cut the costs of your UK trip, whilst making friends with countless other backpackers along the way – win win! Whether you’re a solo traveller, one half of a wanderlust-fuelled couple or a Brit wanting to explore a bit more of your own back yard, we have the best hostels in the UK for you here! Thanks to its small size, safety and extensive transport links it couldn’t be easier to travel the UK on your own – although we all know you’re never really alone when you stay in hostels. The UK has hundreds of them; stay in one of these and you might even meet a travel buddy for life. Wombat’s is a consistently busy hostel that’s a great place to mingle with fellow backpackers – in fact, it was our most popular hostel in London for 2018! Ease off any solo-travelling nerves as soon as you arrive with a free welcome drink, and if you feel like carrying on there’s bound to be someone in the common room up for checking out the famous nightlife in nearby Shoreditch. Wombat’s’ great location is also within walking distance of some of London’s most exciting sights including Tower Bridge and the Tower of London. This charming seaside hostel knows that even solo travellers need a bit of privacy sometimes, which is why they offer single occupancy private rooms for you to recharge in. Don’t worry though, there’s still plenty of opportunities to meet other travellers for a beer in their chill-out bar or over a pizza from their on-site restaurant. Their prime location is perfect for exploring the best of Brighton, from its quirky city centre to iconic seafront. You might arrive to Hatters Hostel as a solo traveller, but after experiencing one of their famous Liverpool pub crawls you’ll have plenty of new friends – and stories to tell! The hostel puts on social events 6 nights a week and their friendly, fun staff will make you feel part of the family. You’ll love Liverpool’s mad nightlife, but on the evenings you don’t feel like making the 5 minute walk to the city centre we’re sure you’ll find something going on in the hostel bar, games room or BBQ area. The UK can hold its own against the likes of France and Italy as a romantic destination – no, seriously! From the idyllic natural landscapes of Ireland to the cobbled streets of Edinburgh or the swanky restaurants of London, there are plenty of places in the UK that will inspire your inner Casanova. And the romance doesn’t have to stop just because you’re in a hostel – these ones are tried, tested and loved by couples. Set in a grand, historic mansion, Palmers Lodge is certainly not your average hostel. Couples love it because after spending a night playing beer pong in the pub downstairs, they can bypass the dorms and head for their own double bedroom with en suite. Those looking for a quintessentially English experience will appreciate its original Victorian architecture and exposed brickwork – very Jane Eyre! On top of a traditional English pub! What’s more romantic than sleeping in a private hut under the stars? Skyewalker Hostel offers exactly that; it’s a rural escape in the Scottish Highlands that’s a total dream for couples seeking a little isolation. Explore lush green landscapes, learn Scottish folk music and even go whale and dolphin watching at the local beach. Nearest station: There is a bus stop outside the hostel but plan your journey in advance as public transport is sporadic! This multi-award winning hostel gives couples the best of both worlds. Whether you choose to spend your evening partying in their nightclub Belushi’s or watching a game in their underground sports bar, you’ll be able to retire to your own space at the end of it – without having to sacrifice that unbeatable hostel atmosphere! Top tip: if you book in advance, ask for the room with the view of The Shard. If you’re here for a good time, not a long time, or just want to see if us Brits can really drink as many pints as we claim, these are the hostels for you. Get ready for some late nights, happy hours and banging tunes. NosDa means ‘good night’ in Welsh, which is what you’re guaranteed to have at this buzzing hostel on the River Taff. Not only does it have a lively bar, it’s also a music venue that sees performances from local bands several nights a week. Who says no to a free gig?! If you’re lucky enough to be in Cardiff for a rugby game (but can’t stretch to a ticket) there’s no better place to watch it than on the hostel’s big screen. The Welsh are passionate about their sport and the atmosphere at NosDa is electric. What better place to get your drink on than a traditional London pub? That’s where you’ll find Hostel One. The staff here will help you to experience London’s nightlife scene, as they lead different alcohol-fuelled outings every night of the week. Just make sure you take advantage of their daily happy hours first, as well as your free dinner – they’d rather you save that food budget for partying! Glasgow’s nightlife is some of the best in the UK, and Euro Hostel’s bar is where a lot of backpackers and Glaswegians choose to kick off their night. After you’ve loaded up on cheap drink deals, Glasgow is your oyster – and this hostel is the shiny pearl at its centre, being only a stone’s throw from the most exciting bars and clubs. You might have a fuzzy head in the morning, but we’re sure an all you can eat breakfast buffet for £5 will help. We get it; sometimes when you’ve been on the road a long time all you crave is a bit of quality time with number one. That’s where these hostels come in handy – they all have excellent private bedrooms that our guests love. Seasoned European travellers will know all about Generator Hostels. This one is the original and offers several comfy private rooms. Our guests describe it as a ‘well-organised hostel with good and professional staff’ and say they love ‘meeting people from around the globe’ in its ‘lively, atmospheric bar’. It’s in the perfect location for anyone who’s bucket list includes catching a West End show (and having their own cosy room to return to afterwards). This hostel may be smack bang in the centre of Edinburgh, but you won’t need to worry about getting a great night’s sleep in your newly renovated private bedroom. Don’t be tempted to spend too much time in there though as you’ve got a lot of Edinburgh to see – starting with the free city tour offered by the hostel. You’ll still have plenty of opportunities to socialise with other travellers, like over a game of pool or darts in the busy common room. Wombat’s is no one trick pony – they also have some fantastic private rooms. And if you’re a traveller who likes their creature comforts, you’ll be impressed to hear that they’re two-time winners of our cleanest hostel worldwide award! We’re guessing you’ll also want to spend a few extra pounds on their all-you-can-eat continental breakfast? Yep, we thought so. Hostels for the backpacker who values convenience and hasn’t got time for blisters. Perhaps you’re making a brief visit and want to be in the heart of the city, or just want to save on hefty taxi fares, these hostels are so centrally located you’ll be able to do most of your sightseeing by looking out the window. If you’re one of the many travellers who visits Edinburgh for a taste of history then look no further than Castle Rock Hostel. This 200-year-old building is just a one minute walk from Edinburgh Castle, Old Town and the many sights and attractions of the Royal Mile. Be warned that there’s a steep hill to climb up to Castle Rock, but you’ll be rewarded with unmissable views and breath-taking sunsets over the city. Vibrant, modern, colourful – three words to describe this stylish hostel and its surrounding neighbourhood of Soho in the heart of London. Prepare to (window) shop ‘til you drop with Oxford Street just minutes away or be dazzled by the bright lights of Leicester Square and Piccadilly Circus. You may be at the centre of London’s poshest nightlife, but your budget will stay winning with half price drinks and cocktail specials on the rooftop bar! Spending a night in the police station is every backpacker’s nightmare – apart from those who’ve stayed at The Bristol Wing. This hostel inside Bristol’s refurbished ex-police headquarters is ideal for a quirky stay in Bristol city centre. It’s received rave reviews from our guests, who love its excellent cleanliness, chilled-out vibes and fantastic food. And best of all, their profits go towards helping homeless youth in Bristol. This beautiful Grade II listed hostel building is ideally located just minutes from York’s famous historic centre, so it couldn’t be easier to explore the city’s biggest draw. And trust us, there’s a lot to explore; so you’ll appreciate Astor’s picturesque garden/patio area, cosy common room and fully stocked bar to recuperate in after your busy days! They also offer breakfast, provided you make a small £1 donation to a local charity. Our guests absolutely love the ‘friendly and helpful’ staff at Global Village, who they say go ‘above and beyond’ to make travellers feel at home and ‘ignite friendships’ by arranging nightly pub outings. They’re just one of the reasons why this lively hostel won our award for the best in Northern Ireland! It’s located among the bustling student pubs and bars of Belfast’s Queen’s Quarter, so you’ll never go thirsty, and when you want to explore the rest of the city their expert staff can help you to book the perfect tour. Alert – another award winner! The recently refurbished YHA Liverpool won our 2018 award for the best hostel in England, so we could hardly leave them out, could we? With a fantastic waterfront location on Liverpool’s famous Albert Dock, this hostel is close to the city centre, Tate Gallery and Beatles Story. In fact, any travellers coming to Liverpool for the latter will love this hostel’s ‘Fab Four’ themed interior! You’ll meet other backpackers in the YHA bar; the best place for a relaxed drink before you step out into the craziness of Liverpool’s nightlife scene. 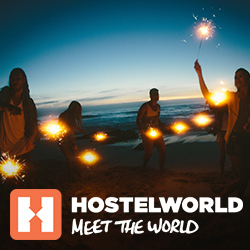 The post The 15 best hostels in the UK for 2018 appeared first on Hostelworld Blog.